Even before I’d posted the consequences of our working lunch, there were more contributions on the horizon. Without dropping names (and risking offense or seeming to apply pressure), here are a few more possibilities for October. Agincourt’s Roman Catholic church was dedicated to Ahab, an obscure 4th century saint. You’ve probably heard his name nowhere else but here, because there are just two churches bearing his name today: one in Azincourt, France (yes, the French spell the name differently than the English), where his relics are preserved, and our church here in Iowa — at least until the name change circa 1950. Two exhibition pieces are connected with Ahab. First, someone has been working on an Orthodox icon of Saint Ahab—at least it began that way (egg tempera on olive wood, in true Eastern Orthodox style) but appears to have drifted toward the Pre-Raphaelites, an absolutely intriguing prospect as far as I’m concerned. The very idea of blending those two iconic styles (no pun intended) whets the appetite. So with any luck and a good tail wind, Saint Ahab will join the festivities. The original St Ahab’s church exists only in my imagination. It was outgrown by the 1890s and replaced with a Victorian Gothic non-entity that was, in its own time, replaced by the mid-century modernist masterpiece by Chicago architect Francis Barry Byrne—actually by friend-of-the-project Richard Kenyon who has been a contributor from the start in more ways than I can say. Drawings of the Byrne–Kenyon collaboration were displayed in 2007, and I had hoped to build a model of it for 2015 but that didn’t happen. Imagine that: me biting off far more than I can chew. Now, however, as recently as this afternoon, there are intimations that Christ the King will be part of the mix. Color me excited. With the Episcopalians (St Joe’s) and Roman Catholics (St Ahab and then Christ the King) represented, I’m almost forced to balance the scales with some other religious building of a different sort. The Agincourt Islamic Center was part of the 2007 show, as was Christian Science. I don’t recall if the Lutherans were there, though they do have a building to show for their presence; meanwhile, the Baptist church—besides being the oldest continuously occupied church in Fennimore county—has been described but only sketchily designed. But the Wesleyans of Asbury UMC and the Jews of Temple Emmanu-El are closer to inclusion than most other faith traditions. In this case, the follow-through rests with me. 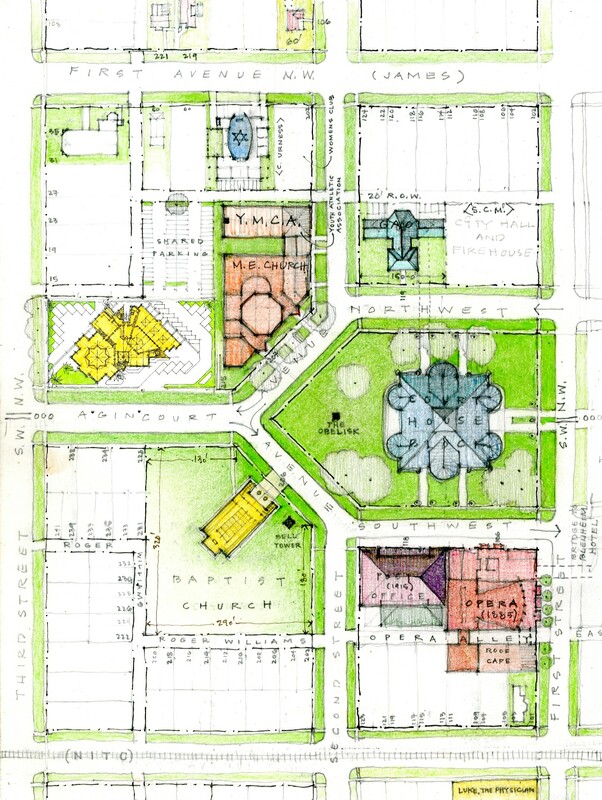 This chunk of town, just west of the Square, shows several prominent public and semi-public buildings: the second county courthouse (in blue), the opera house and Federal Building, just south; the Baptist church (the yellow diagonal), the Methodists (in orange), Islamic Center (west of the Methodists, also in yellow) and the synagogue (on the north side of that same block, in blue). That single five-sided block, by the way, surrounds the justly famous “ecumenical parking lot” shared by Muslims, Jews, and Methodists on, respectively, Friday, Saturday, and Sunday. Let it not be said that Agincourt is not at the leading edge of diversity. By the way, what would you call “an addendum to the working lunch”? Dessert? By agincourtiowa in Uncategorized on Monday/12/March/2018 .